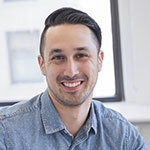 Alex Freed is a Director on the Client Solutions team at 605, working directly with existing and prospective clients to identify opportunities to make their advertising and media planning more progressive and measurable. Prior to 605, Alex worked as Analytics Media Group's first Media Director, focusing on both traditional and advanced TV, including linear optimization via automated platforms and addressable TV testing. Alex began his career at Mindshare in the National TV buying and planning department, where he worked on studio clients for five years. Alex graduated from Vanderbilt University in 2009 with BAs in Communications and History.